The Getty Center is more than a museum. 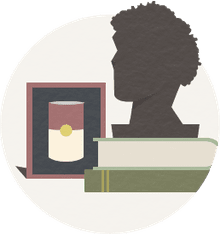 It is a campus that encompasses research libraries, museum conservation programs, administration offices, and grant institutions as well as an art museum open to the public. "As architecture," wrote critic Nicolai Ouroussoff, "its scale and ambition may seem overwhelming, but Richard Meier, the Getty's architect, handled a daunting task admirably." This is the story of an architect's project. By the time he was 23, Jean Paul Getty (1892-1976) had made his first million dollars in the oil industry. Throughout his life, he reinvested in oil fields across the globe and also spent much of his Getty Oil wealth on fine art. J. Paul Getty always called California his home, even though he spent his later years in the UK. In 1954 he transformed his Malibu ranch into a art museum for the public. And then, in 1974, he expanded the Getty Museum with a newly built Roman villa on the same property. During his lifetime, Getty was fiscally frugal. Yet after his death, hundreds of millions of dollars were entrusted to properly run a Getty Center. After the estate was settled in 1982, the J. Paul Getty Trust purchased a hilltop in Southern California. In 1983, 33 invited architects were whittled down down to 7 then to 3. By the fall of 1984, architect Richard Meier had been chosen for the massive project on the hill. Because of height restrictions, half of the Getty Center is below ground—three stories up and three stories down.The Getty Center is organized around a central arrival plaza. Architect Richard Meier used curvilinear design elements. The Museum Entrance Hall and the canopy over the Harold M. Williams Auditorium are circular. 1.2 million square feet, 16,000 tons, of beige-colored travertine stone from Italy. The stone was split along its natural grain, revealing the texture of fossilized leaves, feathers, and branches. "From the beginning, I had thought of stone as a way of grounding the buildings and giving them a sense of permanence," writes Meier. 40,000 off-white, enamel-clad aluminum panels. The color was chosen to "complement the colors and texture of the stone," but, more importantly, was chosen "from among fifty minutely varied shades" as the architect negotiated his color scheme with local homeowners' associations. Parking is underground. Two 3-car, computer-operated trams ride on a cushion of air to the hilltop Getty Center, which is 881 feet above sea level. 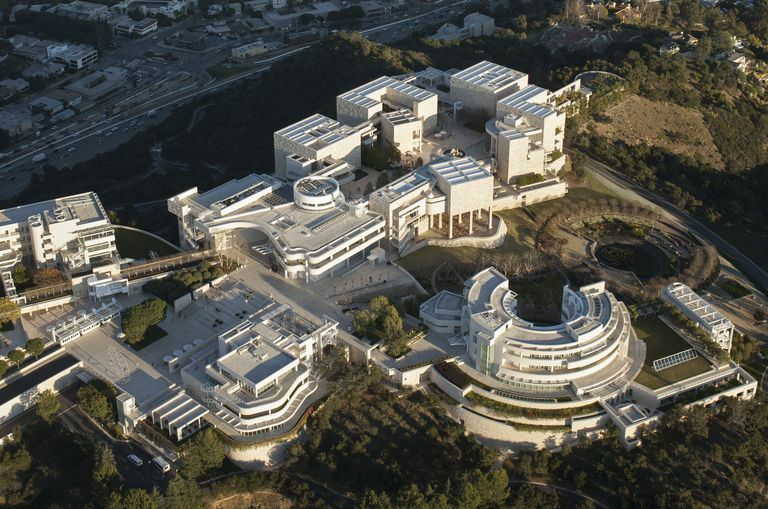 Why is the Getty Center Important? The New York Times called it "a marriage of the austere and the sumptuous," noting Meier's signiture "crisp lines and a stark geometry." The Los Angeles Times called it "a unique package of art, architecture, real estate and scholarly enterprise--housed in the costliest art institution ever built on American soil." Architecture critic Nicolai Ouroussoff wrote that it is Meier's "culmination of a lifelong effort to hone his version of Modernism to perfection. It is his greatest civic work and an important moment in the city's history."